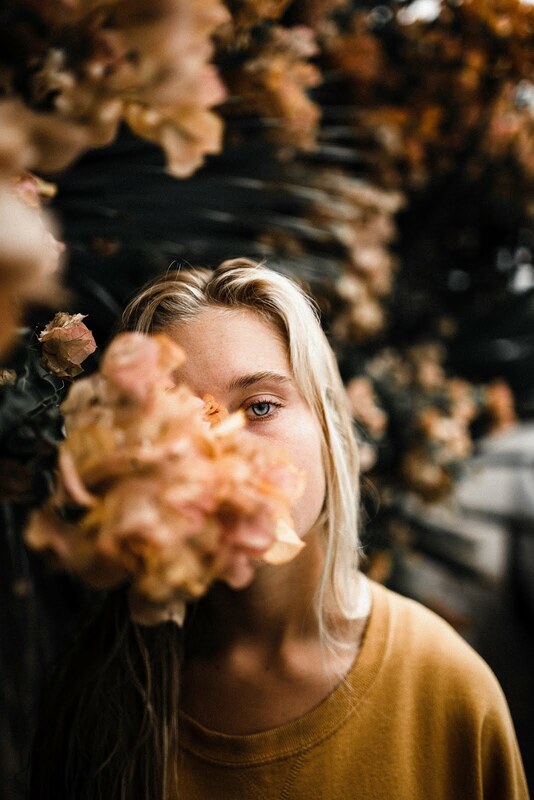 only boy. So, I was kind of sad about throwing out his little tiny baby clothes. There was one item in particular that I was not keen to cast out, and crammed him into it for as long as I could, and that was his very first football shirt! I wanted to hang on to it, but I didn't want it to languish in a box in the loft. So I needed something practical to turn it into, so it could be used and enjoyed! This pegbag is so easy to make, and every household needs one. I thought this peg bag would make a really personal and unusual gift for Mothers Day and you don't have to be remotely talented to make it, as I have shown! I have put together some very simple instructions, so even the most sewing-phobic can have a go! Firstly, find a suitable item of cuteness. Ideally it needs to be short sleeved, or sleeveless, with a fairly wide neck opening. 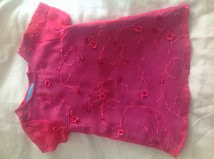 This pink dress is ideal, because it has buttons down the back, so you can make the neck as wide as you need. Next, turn it inside out and pin a line along the bottom of the dress, taking care to ensure the sides meet all the way across. Using the pins as a guide, sew a seam along the bottom of the dress. As you can see from the pictures, it does not have to be perfect! You can do this by hand, it doesn't take long, or with a very basic sewing machine. I used a machine, just for speed and general laziness. Once the seam is finished and secured, just turn the whole thing right side out, and you're pretty much done. Add a child's coat hanger and some pegs! I love this design best, using a lovely frilly dress, I think it's got a real country cottage feel, but it works equally well with T-shirts. Don't forget, you can still make this if your children are bigger, just pay a visit to your local charity shop or jumble sale. 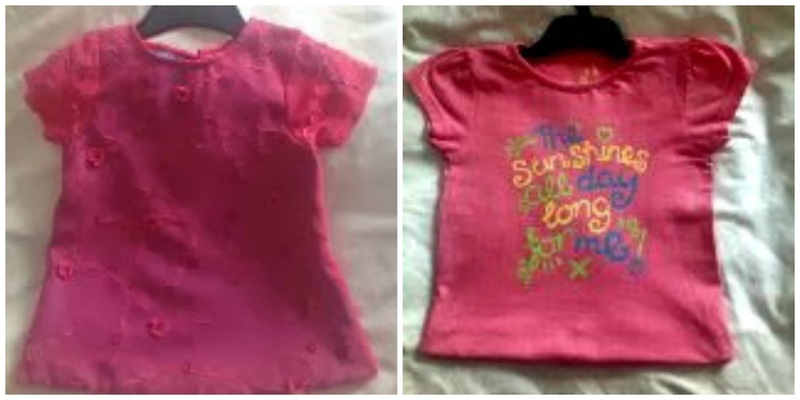 Baby clothes get hardly any wear, so there's lots of lovely items to be found! Great idea to reuse your boy's first clothes in this way. this is an amazing fun and creative idea. Definitely one that should be passed around mother's groups. I know plenty of mother's that would love to do this even if Mother's day wasn't around the corner. I like the way you don't have to be great at sewing! 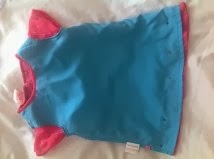 The only thing, how do you decide which items of your child's clothing to use? thanks for sharing. 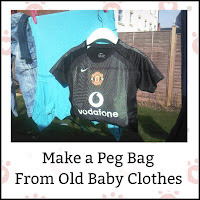 What a fab idea and a great way to get use of some keepsake clothes! 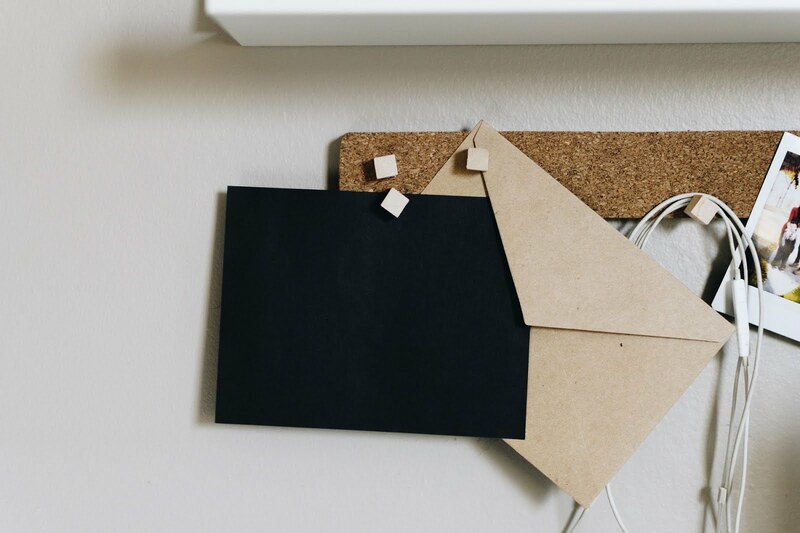 A great way to upcycle! This is just so cute. Great idea to get some more fun out of barely used clothes. Awww what a sweet idea! Lovelt to have some mementos oh when they were small! What a brilliant idea! And you could use so many different things to make one - genius! What a fab idea! Something useful and with special memories attached to it... nice one! Lovely idea, let us hope we can get the clothes pegged out soon, I'm sick of the dryer being on all the time!